These creamy mashed potatoes are ultra-fluffy, velvety and rich. They have so much richness and flavor – a perfect side dish for any meal. 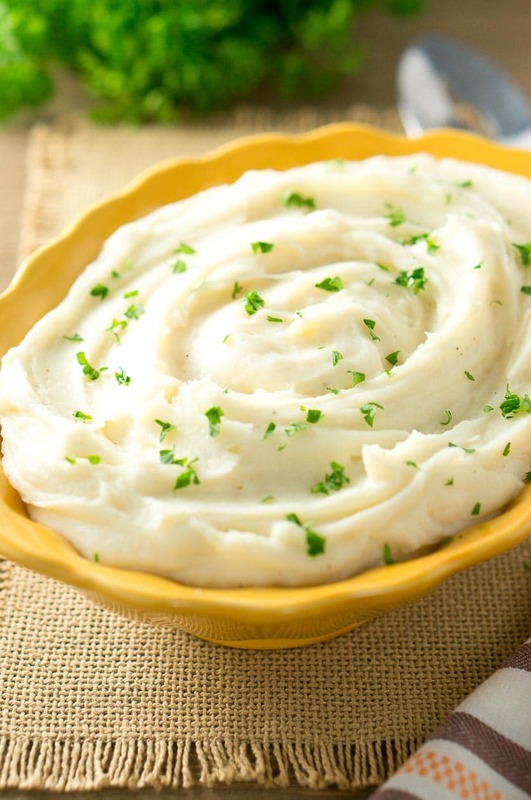 There are so many ways to make mashed potatoes. Some people use only butter, some only milk, and some like to mash them with the skin on or add garlic and spices. I prefer to peel the potatoes. You can make them more chunky or creamier if that’s how you like them. 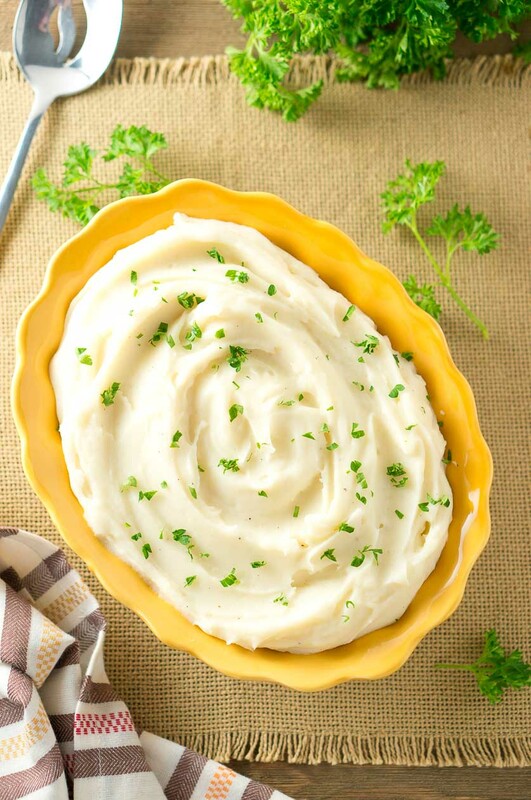 Today, I am sharing with you a recipe for the creamiest mashed potatoes. They are so delicious and buttery, they melt in your mouth. They are great for the holiday table and everybody will be asking for more. If you make them for a holiday like Thanksgiving, you can place them in the slow cooker and keep them warm until they are ready to serve. Also, this recipe is so easy to make, it has only 3 main ingredients. The other ingredients are salt, pepper, and water for boiling. 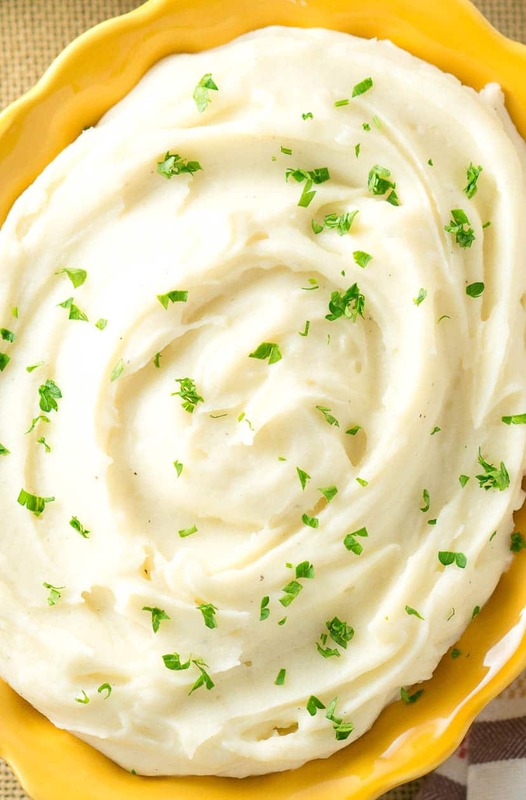 There is a fine line between creamy and gluey mashed potatoes. 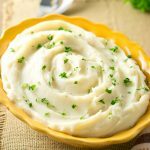 I have tried several different ways, and here are my tips for the perfect creamy mashed potatoes. Use Yukon Gold potatoes – I found that Yukon gold potatoes were perfect. They are naturally creamier than Russet potatoes and have a slight buttery flavor. Rinse the potatoes – rinsing the potatoes before boiling them helps to intensify their creamy texture without making them gluey. Use lots of butter – I used 3/4 cup of butter (1 1/2 sticks). Soften the butter or add it directly to the hot potatoes, but don’t use melted butter. Don’t overmix them – mixing or mashing the potatoes for too long will make them gluey. Use a mixer to whip the potatoes – mashing them with potato masher would not result in the same smooth and creamy potatoes. You will need between 1/2 lb to 3/4 lb of potatoes per person, especially since most people tend to pile up on potatoes. When they are fluffy and creamy, they go fast. If you happen to have any mashed potatoes leftovers, you can always check out some of my other potato recipes: Potato Patties and Easy Skillet Shepherd’s Pie. If you are wondering how many potatoes you need for 10 people, use about 7.5 lb or 15 potatoes. And adjust the amount accordingly if you are making mashed potatoes for 15, 20 or 30 people. While potatoes are not paleo or low-carb, they are healthy because they are a whole food that hasn’t been processed and is rich in nutrients and loaded with vitamins – vitamin B6, vitamin C, potassium and they are a good source of fiber. Since potatoes are so good for you, some people are losing weight with the potato diet (eating only potatoes for months). I consider everything healthy that you can plant yourself in your garden and eat right away. Because potatoes are high in carbs, I tend to eat in moderation and not overindulge on potatoes. Even though that can be really hard when they are so good – so creamy and rich. While a lot of mashed potatoes recipes call for milk, if you don’t want to use milk, you can substitute it with coconut milk or almond milk. 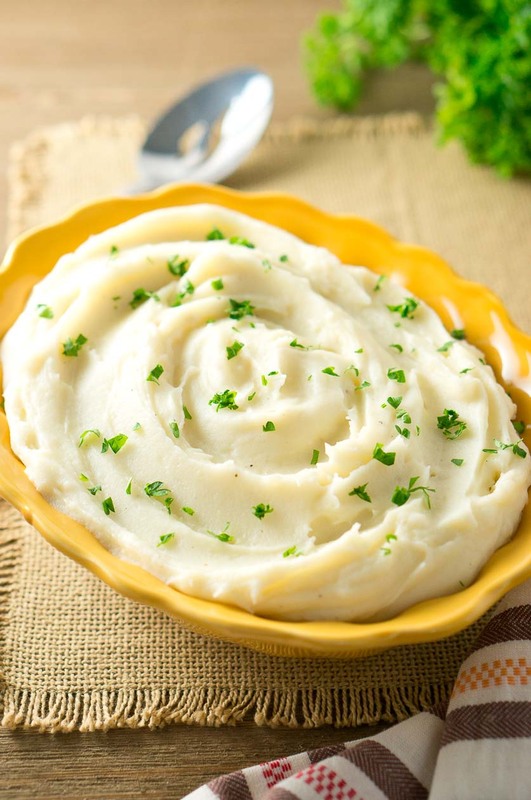 You can serve mashed potatoes with most types of meat – poultry, beef, pork, lamb. Also, they go great with seafood. Therefore, the options are endless and your creativity is the limit. I love to serve mashed potatoes with chicken, beef, and pork. For example, you can serve them with my Pork Tenderloin recipe. The result is a heavenly and easy dinner! 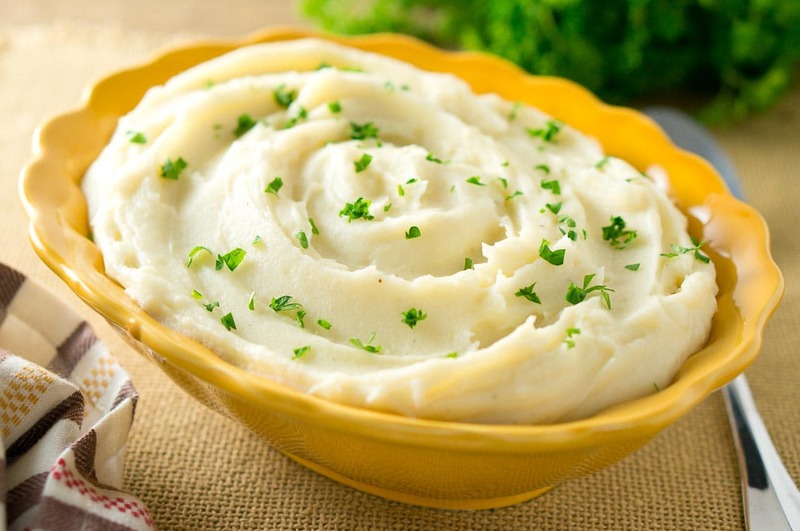 Wondering how to make mashed potatoes? Check out the recipe below. Best mashed potatoes are fluffy and velvety. They have so much richness and flavor - a perfect side for any meal. How to make mashed potatoes without milk. Place chopped potatoes in a medium pot, add water and cook on high heat on the stove. When they start boiling, cook for 5 minutes. Reduce heat to medium-low and cook for another 20 minutes. Remove pot from the stove and discard the water. Add butter, milk, salt and black pepper to the potatoes and mix with the mixer on high speed until potatoes are creamy. It is not necessary that you completely cover the potatoes with water. 2.5 cups should be enough to cook them if the pot is covered with a lid. Otherwise, if you use too much water, they may turn too watery. Creamy mashed potatoes are NOT American cuisine, they are global! 🙂 I know Paul! My recipe card allows me to pick only one country, there wasn’t an option for ‘global’. 🙂 But I agree with you, they are international cuisine. I will ask the developer to update the cuisine options on the recipe card. Velvety potato perfection! I can never say no to mashed potatoes! These look divine! Best mashed potatoes I’ve ever had ? Thank you for the recipe!